salt and ground white pepper to taste. Recipe: Season the salmon fillet and place it over parchment paper in a baking pan. Mix the crab meat with the cream, chopped dill, Tabasco, lemon juice and season to taste. Spread the crab mixture over the salmon fillet and press it gently. Put some pearl onions on top. Pour 2 ounces of water in the baking pan. Cook in a preheated oven at 400 F for 15 minutes or until ready. Cover the salmon with aluminum foil while baking, if you think it is necessary. 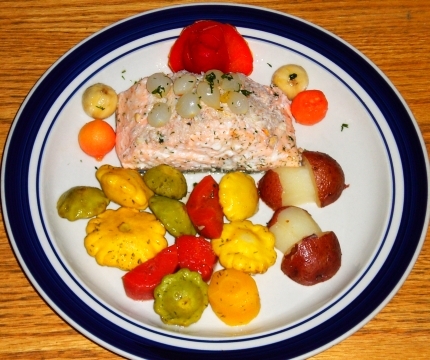 I served the salmon fillet with paddy pan squash, multicolor carrots and mushroom-shaped roasted red skin potatoes.